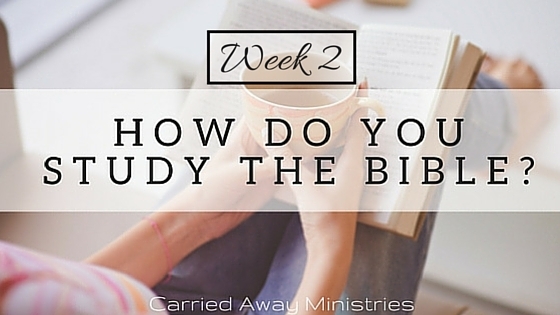 Week 2: How do you study the Bible? Who’s ready for Study Method #2? If you missed last week’s post, here is Method #1: Two Questions. Let’s get right to it! This second way we can approach the Bible when we want to study it for ourselves is probably the most widely used. It’s called THE SOAP METHOD. To download a FREE printable version of this page, CLICK HERE. Here’s how I would use The SOAP Method. I read the text one time through, acquainting myself with text. Then I read it again, this time looking for a specific verse (or verses) that jumps out a me. Jumps out at you?!? What in the world does that mean? When I’m reading, I’m looking for the part of the scripture that for some reason resonates with me. Maybe it’s a verse that makes me smile. Maybe it’s something that ruffles my feathers. Maybe it challenges me. Or maybe for some reason it just sticks out as I read. *Only the second part of verse 74 stuck out to me so that’s why I wrote 74b. The first part of the verse would have been considered a. Now I’m laser-focused on my verse and really start digging in. This is where I start asking myself questions about the verse. What do you see in this verse? What can you learn? Are there any commands to follow? Warnings to heed? Principles to apply? What’s the overall message of the verse? How does this verse fit into context of the entire passage? I’m not really into keeping things neat and tidy, so this is also where I ask questions that I don’t know how to answer. If I’m really engaging with the text, there will be plenty. This is also where I look up definitions of specific words for clarity. 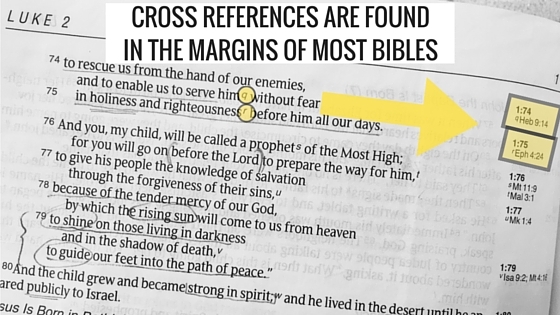 The verses I’m looking at have two cross-references, one in Luke 1:74 (identified by the q) and one in 1:75 (r). I look in the margins to find the corresponding verses and read them to see if they add any additional insight to my understanding of these verses. I would also probably look up the verse in several different translations (because I can’t help myself). This helps me to wrap my head around the full meaning of the scripture. I use BibleGateway to quickly flip through multiple translations. You can read about some of my favorite translations and why I like them here. How would you put this verse in your own words? Follow the rabbit trail. Write all of it down. The Messiah was coming to save His people. Are verses 74 and 75 the purposes of salvation? To rescue us from the enemy and to enable us to serve Him without fear in holiness and righteousness. ??? Hebrews 9:24 – Jesus’ blood saves me from sin so that I can serve God. Jesus came so that I could worship Him (serve Him, live with Him) without fear because He makes me holy and gives me right standing with God. Now it’s time to apply what I’ve read to my life. How can I apply theses truths to my life? How can I put the Word into action? Often times I turn my observations into application questions to chew on. This keeps the text with me and gives me something to process and talk to Jesus about all day long. I realized as I was working through this verse that it stood out to me because it went right along with the lesson I’m learning about sanctification in the study I’m doing with friends. I love how God confirms and reaffirms the truths He’s teaching me by giving it to me from many different angles. Lastly, I turn my application into a prayer. As I said, I like to keep my conversation with Jesus open about what I’ve read. 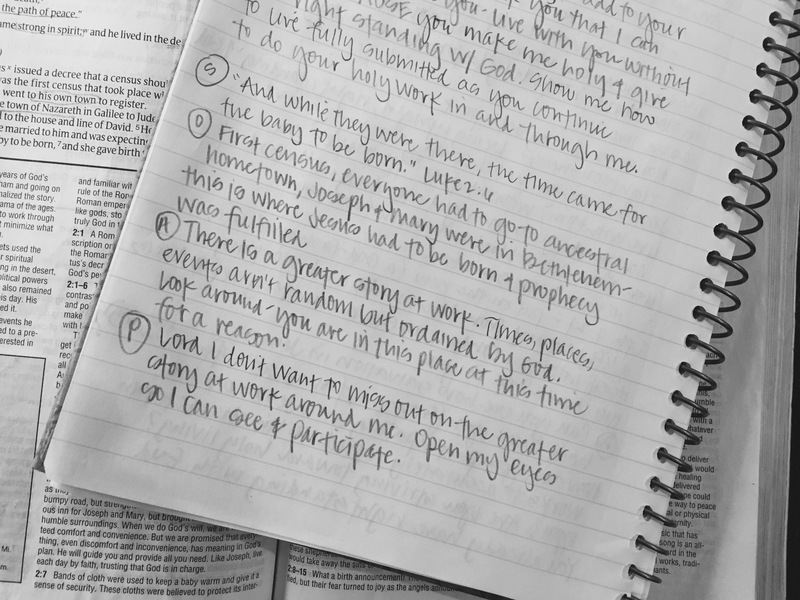 The purpose of Bible study isn’t to do the work and check it off my list. The purpose is to get into the Word so the Word can get in me. This happens best when I allow my conversation (prayer) with Jesus to stay open. Jesus, I know I have nothing to add to your work on the cross. Thank you that I can worship you – serve you – live with you without fear BECAUSE you make me holy and give me right standing with God. Show me how to live fully submitted to you as you continue to do your holy work in and through me. Again, this one ended up being longer than most, but we get out of it what we put in. You can scratch the surface and walk away with truth. There’s nothing wrong with that. However, if you keep digging, you just might find some buried treasure. I definitely got more out of this one verse than I ever would have if I had just read it and moved on. After practicing this method for the last couple of weeks, I’ve decided that I like this method for the simple fact that it allows me to really dig deep into one verse. If this becomes the method I begin using regularly, I would probably write the verse on a note card so I could keep it in front of me all day long. 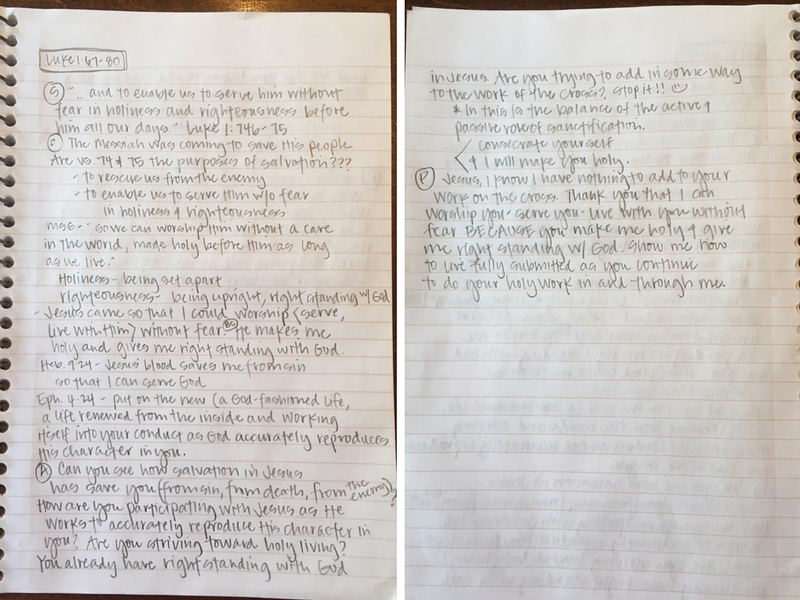 The thing I don’t like about that method is that because I’m so focused on the one verse, there’s a possibility that I could miss out on the overall message or lesson from the entire context of the text. 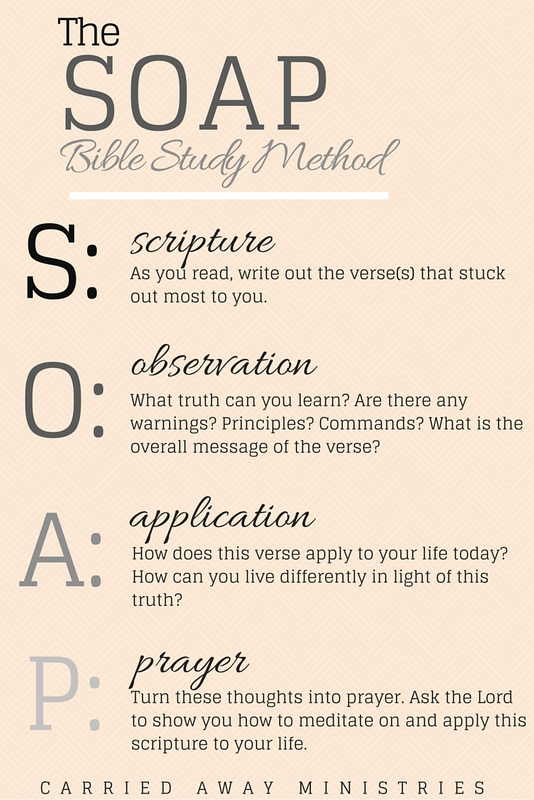 Because that bothers me, I would probably start with the Two Questions Approach first, then apply The SOAP Method to the one verse that stuck out to me. So, what do you think? Practice it this week and let me know! Next week we’ll be digging in even deeper for Method #3, so stay tuned!